Composer and pianist Julien Brocal shares an introspective and hopeful perspective on nature, art, and human connection. In collaboration with violinist Caroline Goulding, the two bring his philosophy to life through music. A lyrical poetic-performance film featuring Alexander Calder's sculpture, the Stainless Stealer and Julien Brocal on piano. Visual poetry film inspired by Patrick Dougherty's sculpture, Daydreams. Music by Eunice Kim and Julien Brocal. Visual poetry film inspired by Mark di Suvero's sculpture, Beethoven's Quartet, with music by the Dover String Quartet. Visual poetry film. Music drives the light across a wide Montana landscape. Music by Eunice Kim. A short poetic film by Kathy Kasic about the interplay between culture and nature. Loose Horses is a PBS documentary about unwanted horses in the United States. Astronomy: an alignment of three celestial objects, such as the sun, the earth, and the moon or a planet in a gravitational system. Biology: the pairing of chromosomes in meiosis. Philosophy: a close union. Syzygy was a live cinema performance in August 2015 at the Kyma International Sound Symposium with musicians Kiyoung Lee and Ha-Young Park. A 30 second spot for Sacks Thrift Store. Produced for Trout Unlimited, "Against the Current" underscores the importance of healthy rivers and streams in the arid West. This film tells the story of a rancher who, after 70 years, restored water to the stream that feeds his ranch. Completed in 2007. 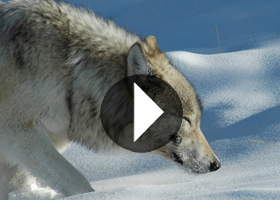 "Introducing Montana's First Nations to the World"
This short film documents the reintroduction of the grey wolf to Yellowstone National Park after 70 years' absence, showing just one of the amazing things that happen when you bring global organisations together. It’s easy to overlook small tributary creeks, but they play a big role in ensuring river health—and fishing opportunities. In this video, Lyndy Caine of Firehole Ranch in Montana speaks about her collaboration with TU to preserve healthy flows and habitat in Watkins Creek, which serves as a wild trout nursery for Hebgen Lake. Produced for Trout Unlimited National Western Water Project. The destruction of Spread Creek dam near Jackson, Wyoming. The ranch manager for the Pitchfork Ranch in WY talks about river conservation. Produced for Trout Unlimited and Trust for Public Land to help protect the Madison River Valley. Produced for BBC. "The FIshman" received over 8 million viewers on BBC, and traveled to numerous film festivals, including: Banff, Telluride, Wild and Scenic, Wildscreen, Jackson Wildlife Film Festival and International Wildlife Film Festival. Read an article in the Billings Gazette about the film.